South Asia is one of the four early places where human civilization began—similar to Egypt (Nile), China (Yellow), and Iraq (Tigris and Euphrates). Civilization in South Asia began along the Indus River. The land of South Asia is dominated by three main types of physical features. Mountains, rivers, and the massive triangular-shaped peninsula of India. 50 or 60 million years ago India slowly smashed into Asia and formed the Himalaya and Hindu Kush Mountains that nearly block off India from the surrounding area. Except for the coast, there are only a few narrow passes through the mountains such as the Khyber Pass that have allowed people to enter this land. The other main physical features are the Indus River in modern day Pakistan and the Ganges River in modern day India. The Indus River is in a very dry area called the Thar Desert--this Arid climate is the site for another of the world's first human civilizations. The water in the Indus River mainly comes from melting glaciers and natural springs from the mountains that surround it. As the water runs down the mountain it picks up fertile silt. This area would flood at least one time every year and provide irrigation water for farmers. When the flood waters went away the left a thin layer of fertile silt. Today, much of South Asia experiences an annual change of wind direction called monsoon that usually brings massive amounts of rain. Some historians claim the Indus Valley received two annual floods. Some of the oldest human remains in South Asia date back to around 75,000 years ago. These early humans made tools and lived a nomadic hunter/gatherer life. Artifacts indicate that around 5000 BCE, farming developed in South Asia. Slowly, people began to live in permanent places and villages slowly developed—eventually these villages turned into cities and created one of the earliest human civilizations in the world. This civilization is known by many names: Ancient India, Indus Valley, and Harappan Civilization. Historians and archeologists believe the Indus Valley Civilization began around 3000 BCE. There is evidence of trade between Ancient India and Mesopotamia as early as 3200 BCE. This an other evidence suggests Ancient India relied on trade in a larger way than other early civilizations. 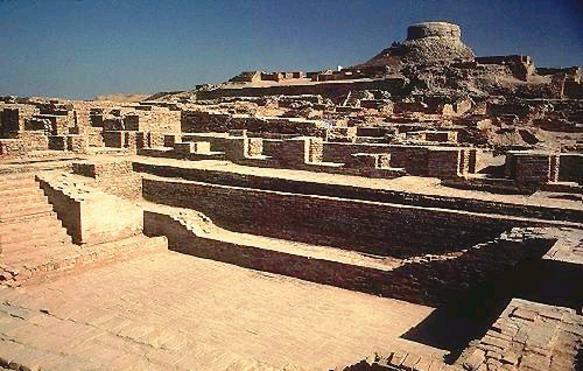 Ancient India is often called the Harappan Civilization because one of the ancient cities was called Harappa. 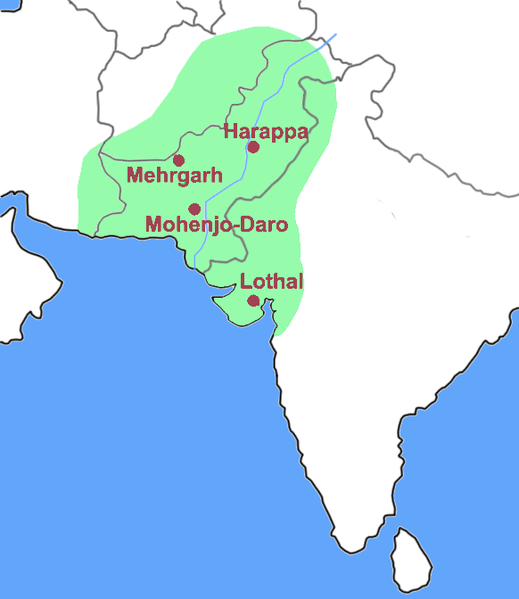 Harappa was just one of 1500 cities in the Indus River Valley. Another well-known city is called Mohenjo-Daro. Historians estimate Ancient India to be the biggest of all four early civilizations. This civilization was not discovered until the 1920’s CE, and much of this civilization remains a mystery. One reason the Indus Valley civilization is so mysterious is because historians have not been able to translate their complicated written language called Indus Script. There are thousands of artifacts with 400-600 different written symbols. Most of these symbols were pressed into soft clay with seals. A seal is similar to a stamp that makes an impression in the soft clay. Seals are sometimes in a cylinder shape so they can be rolled on the clay. Indus Script symbols have been discovered in Mesopotamia, which suggests they maintained a regular trade. The archeologist have found the remains of cities to be incredibly well planned out. Historians estimate that each major city could support as many as 80,000 people, so Ancient India was by far the largest early civilization. The buildings were made from mud-bricks that had been fired in a kiln to make it harder. A kiln is a hot oven or furnace to bake clay pottery. City planners started by digging water wells and water drainage systems with main roads and small roads laid out in a square grid. Finally homes were built along the roads, sometimes with multiple stories. It appears that most urban homes had water drain systems in the their home--a technology that wouldn't be matched in history for over 3000 years. However, most people didn't live in the urban areas. Most people lived in farming villages in rural areas. Farmers domesticated several plants including melons, wheat, peas, dates, sesame seeds, and cotton, as well as many animals. Archeologists have discovered what food the Ancient Indian people ate by examining the teeth of skeletons and food storage areas. Another example of how well planned the Indus Valley civilization was is their grain storage building. Some historians believe they have discovered a massive granary nearly 200 feet long to store and dry wheat. However, there is no evidence of grain in this building, so once again, historians are uncertain about the mysterious Indus Valley civilization. Ancient India was different from the Egyptians and Mesopotamians in several ways. One way they are different is that there appear to be very few large structures in Ancient India. One of the largest structures that has been discovered is called the Great Bath. Basically its a public pool that is over 40 feet long, 20 feet wide, and nearly 10 feet deep. If large temples or palaces once existed they are gone today. This leads to a curious question--did Ancient India have kings or high ranked religious leaders? What did the social pyramid look like? The remains of the civilization suggests they were a very egalitarian society. Egalitarian means everyone in society was basically equal. Another difference is in military and weapons. There is very little evidence of weapons and military culture in the Indus Valley. Another difference is that astronomy seems to be less important in India than in other civilizations unless the text has been lost. The Indus Valley religion is also mysterious because the language hasn't been translated. Historians believe they may have worshiped a Mother Goddess. They believe the Great Bath could have been used for some type of baptism. A small artifact has been found that some historians think may be a priest (right), but archeologists have yet to find a temple of any kind. Some of the Indus Script symbols are related to the images of the modern religion of Hinduism (left), but historians don't all agree about the symbols. The image to the left shows a three-faced person sitting in the lotus position. The lotus positions is a Yoga position of meditation where a person sits upright with their legs folded in their lap. Yoga is a spiritual practice of meditation, breathing, and body position used in many religions, especially Hinduism. By 1500 BCE, the once vast and powerful civilization began to decline at some point it suddenly ended. Historians are uncertain why this area’s power declined. There are some theories that a great earthquake crumbled cities and changed the path of rivers, which caused them to move to a new location. Another theory claims the climate may have changed, which forced them to move. Yet another theory suggests invading armies destroyed some cities and forced most people to move. One thing we know for sure is that the civilization that once lived in this area ended and new people moved into this area. Around 1500 BCE, Indo-European people migrated to India. These people came from the area between the Black Sea and the Caspian Sea (purple on the map on the left). 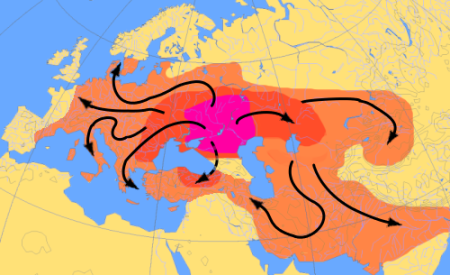 Between 4000 and 1000 BCE, Indo-Europeans migrated all over Europe and Asia. Some went to Europe and influenced the Romans and the Greeks; some settled in Turkey and became the Hittites, others migrated southeast instead. Some stopped in Iran, later becoming Persian, while others continued southeast to Pakistan and India. The slow migration did not arrive in northern India until about 1500 BCE. In India, the Indo-Europeans are sometimes called the Aryans. Some people have disputed this arrival of the Indo-Europeans, however, the spoken language that these Indo-European people brought to India, recorded in Sanskrit, is very similar to other Indo-European languages such as Greek and Latin. There are many examples of similar words between the languages spoken in these areas. In addition, some DNA evidence supports the arrival of the Indo-Europeans to these regions. However, this is a theory of history that some historians don’t agree with. In addition to their spoken language, the Indo-Europeans brought their religious beliefs with them to India. The story and beliefs of Hinduism were recorded in a collection of stories and songs called the Vedas. There are many historians that believe the Hindu religion actually began in the Indus River Valley civilization. The Vedas were first written down in a language called Sanskrit. Sanskrit was a spoken language that was written down in different writing systems that developed later on such as Devanagari--the early form of Hindi (picture on right), India's main language today. Indo-Europeans also brought the domesticated horse into South Asia—this suggests the Indo-Europeans were at least semi-nomadic. The Indo-Europeans first settled along the Indus River, in the same place where the Indus Valley people had lived. They settled down and mixed with the local Indian people. They lived there and eventually expanded throughout the Indo-Gangetic Plain. It was at this time that the caste system got started in India. It is believed that the Indo-Europeans had a similar division of their society, but historians don’t agree about how the caste system originated. The caste system is the permanent division of people into certain levels within society. Each level or caste has particular jobs such as merchant, warrior, or priest. Castes were very important to people's identities. There were four castes, but there was another group below the four castes known as Dalits or Untouchables. Untouchables usually did the worst jobs, like cleaning up people's poop from the gutters, collecting garbage, and dealing with dead bodies. The lowest of the castes was the Sudras - the servants and farmhands who did not own their own business or their own land, and who had to work for other people. The largest number of people belonged to this caste. Above them were the Vaisyas, or farmers and traders, who owned their own farms or businesses. Above these people were the Kshatriyas, or warriors. The most powerful caste was the Brahmins (pictured below), the priests and other leaders. Many historians believe that when the Indo-Europeans arrived they treated the native Indus Valley people as the Untouchables. There were also dozens of smaller groups within each castes. People who came from different castes could not eat together. Usually people from one caste did not marry or make friends with people from another caste. Untouchables were not allowed in temples and were seen as “polluted” compared to Brahmins who were “pure”. 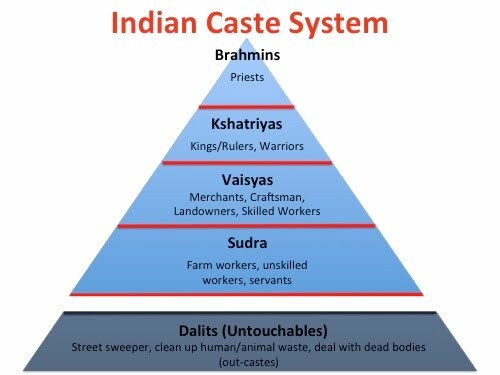 Today, the caste system is outlawed by the modern Indian constitution, and in urban areas most people ignore the caste traditions. However, in traditional rural areas caste divisions still exist. The developing Indian culture of the Indo-European mixed with native Indus Valley people began to grow quickly. 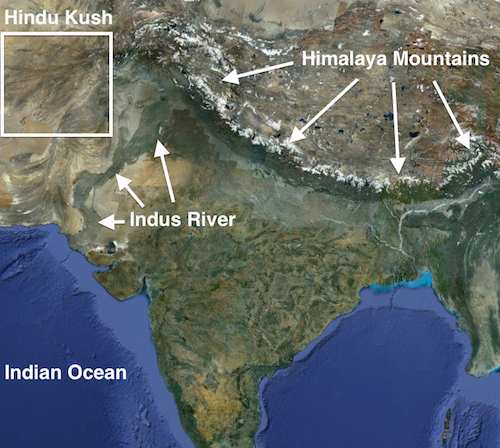 Their civilization spread from the Indus River Valley to the Ganges River. Similar to other civilizations, kingdoms developed as the territory expanded. For about 1000 years the Indo-Europeans and native Indians mixed and migrated throughout the the northern part of the region. Cities began to grow in number, and size and by 600 BCE these slowly developed into 16 different kingdoms called Maha Janapadas. It was during this time period that Siddhartha Gautama gave up his title as a prince to search for truth and an end to the suffering. On his rare trips out of the royal palace, Siddartha noticed most people suffering through life. He also grew tired to the priests who dominated society. He gave up his royal life and started a quest to find real truth. After years of searching, he achieved “enlightenment” and became known as the Buddha or “enlightened one”. The Buddha traveled throughout South Asia and taught others his new ideas—these teachings became known as the religion of Buddhism. Another religion called Jainism also developed during this time. Both of these new religions clearly developed from Hinduism in the same way Christianity and Islam clearly developed from Judaism. These new religions were a rebellion against cultural ideas such as the caste system and importance of priests in religion. Some of the first significant architecture in South Asia also came from these new religions. Since many of the building of the Indus Valley have been lost to erosion, Buddhist architecture has become India's most famous architecture. The first development is called a stupa. A stupa (below, left picture) is a mound-like structure that contains the ashes and relics of a loved Buddhist leader. Later, the stupa transformed into a new Buddhist structure called a pagoda. A Pagoda (below, right picture) usually has many levels or "tiers" of roofs. It is also a Buddhist temple. Today Buddhist pagodas can be found all over China, Japan and Southeast Asia. In 520 BCE, the Persians invaded and took control of northern Indian subcontinent. This conquest was under the mighty Persian leader Darius the Great. Persia controlled this region for about 200 years until Alexander the Great invaded South Asia. Alexander and his army were far from home and completely exhausted from years of constant war as they rampaged toward the east. It was in India that Alexander’s army finally refused to fight, and Alexander the Great was forced to return to Greece. The pattern of Persia conquest followed by Greek conquest occurred in Ancient Egypt, Ancient Iraq (Mesopotamia), and Ancient India. The only ancient civilization that didn't suffer from the Persian and Greek conquest is ancient China. This is mainly due the the barriers of geography. Ancient China is separated from these other areas of civilization by vast deserts and high mountains. These obstacles are very difficult to pass even in today's society. This is the main reason that China developed in a unique way. The Silk Road trade route between China and the the rest of the world, over a 1000 years later would finally link all four major civilization areas. The Persians and Greeks entered South Asia through the Khyber Pass, as did the Indo-Europeans, during their migration into South Asia. The Persians greatly influenced the style of government in India and some Greeks remained in northwest Pakistan and influenced the culture to this day, although the religion of Hinduism has had the greatest influence in India. 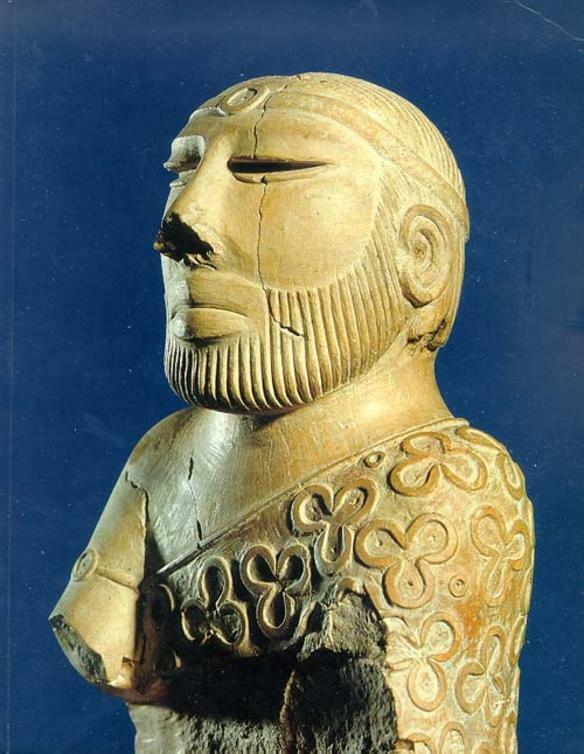 The impact of the Indus Valley is not completely understood, but surely time and archeology will tell.